Naina Kanodia, Mumtaz Mahal, 2009, Oil on Canvas, 48 x 36 in. New York: Indian artist Naina Kanodia’s fantastical works seem to celebrate the simplicity of mundane everyday lives of people all over India. A first glance invokes a sense of cheer and gaiety, the color palette induce a celebratory aura while the imagery, laden with patterns and details, invite the gaze to hover all over the painting. But an understanding of Kanodia’s artistic choices and larger discourse reveals complex and intriguing ways to further delve into her works. An economist turned painter, Kanodia is one of the few Indian artists committed to the genre of L’Art Naif, also known as Naïve Art. One of the early and internationally recognized practitioners of this genre was Henri Rousseau, the French Post-Impressionist painter. Naïve Art is characterized by a simplistic, even childlike, depiction of everyday life. The dismissal of visual perspective, use of vibrant hues, plethora of patterns and emphasis on details lend the works the feel of a storybook. But it is by employing these visual devices that the artist constructs a commentary on the contemporary lifestyle of their times. A closer investigation reveals how these scenes explore complex societal dilemmas and changes. Kanodia’s works display a commitment to Indianess in its use of colors, patterns and themes. Her discourse focuses on the dichotomy of contemporary India- with deep rooted traditions that coexist with a constant influx of western influence. The artist aims to incorporate the confluence of these two distinct tangents that exist simultaneously in her immediate surroundings. Kanodia uses a variety of media- pastels, watercolors and oils. The characteristic color palette associated with her works results from a four layer technique employed by the artist. This method helps her to control the hue and opacity of colors in her works, avoiding a sensory overload. Her dexterity to achieve a balanced palette of vibrant colors evidences her superior skills in handling a variety of mediums. 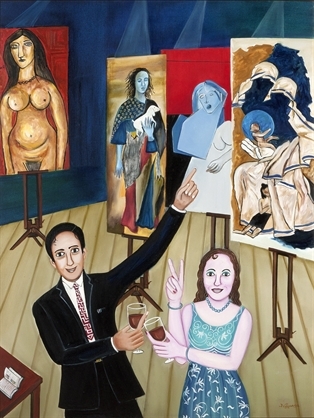 Naina Kanodia, Me and My Boyfriend, 2009, Oil on Canvas, 48 x 36 in. Another characteristic feature of Kanodia’s oeuvre is the patterns she employs to populate her scenes. These are not random decorative features but rather the key that reveals the narrative in her works. 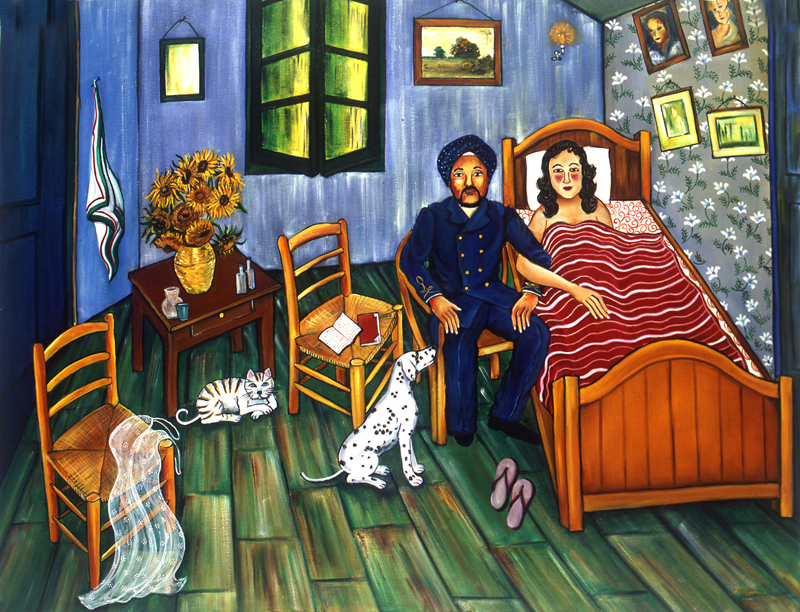 Certain flowers bring to mind Ara’s work while a view of a room references Van Gogh’s own bedroom – elements interjected into an urban Indian living space, pointing towards the global lifestyle of the occupants. There are paintings that show works of renowned painters alongside images of India’s burgeoning urban elites- perhaps referencing their exuberant lifestyle with easy access to the finer things in life. Naina Kanodia, Success, 2012, Oil on Canvas, 46 x 36 in. The artist has held several group shows and solo exhibitions since the mid 1980s. Her works are included in several Indian and international museums and collections including the prestigious National Gallery of Modern Art in India and Musee International d’Art Naif in Paris. The continued relevance of Kanodia’s works can be attributed to the wit and gentle satire she has mastered to capture the contemporary nuances of the many Indias that coexist together.